Miss Universe Thailand 2017 will be crowned on June 29 and pageant enthusiasts are hoping that the winner will sustain the two-year streak of Thailand at Miss Universe which started in 2014. Thailand is proud to have 2 Miss Universe winners and with the Top 6 placement of Chalita at the 65th Miss Universe, there is renewed excitement that the country will finally have its 3rd Miss Universe. 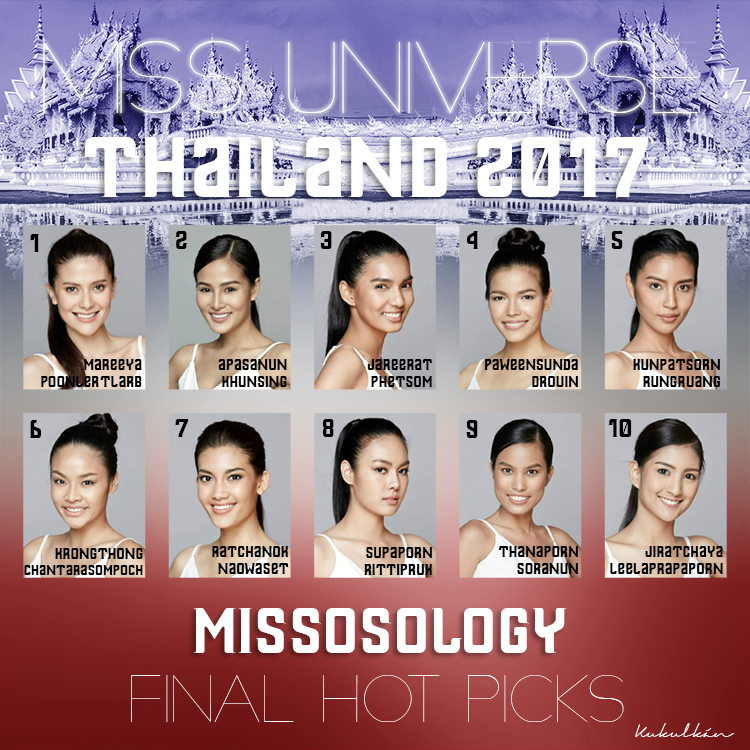 In this list, Missosology-Thailand listed the ten candidates which they believe will be the next Miss Universe Thailand. Which among these lovely ladies do you think will walk away with the crown? 1.) MUT05 Mareeya Poonlertlarb (MUT05 มารีญา พูลเลิศลาภ) – Mareeya has been a front-runner since Day 1 and this charming girl has proven everyone time and again that she deserves that crown. She aced the catwalk and her curvaceous body is definitely an edge. She is also multi-lingual which will come in handy should she will be lucky enough to compete at Miss Universe. If Thailand wants to have its third crown, it must crown Mareeya. 2. )MUT01 Apasanun Khunsing (MUT01 จีจี้ – อภัสนันท์ คุณสิงห์) – Graceful and polished, Apasanun presents a credible challenge to the front-runner. Her model-like demeanour is earning a lot of fans and her sophisticated looks scream Miss Universe. 3. )MUT09 Jareerat Phetsom (MUT09 ใบตอง – จรีรัตน์ เพชรโสม) -Although she is petite standing at 5’5″, Jareerat proved that she can stand tall among the crowd. She’s got a girl next door vibe and her approachable beauty has established a good rapport among the public. 4. )MUT03 Paweensuda Drouin (MUT03 ฟ้าใส – ปวีณสุดา ดรูอิ้น)- Paweensuda’s leggy frame and elegant neck is difficult to resist and it is easy to see why she has legions of fans. Educated in Canada, Paweensuda is conversant with the English language which is helpful considering that Thai beauties in international pageants usually find it difficult to convey their ideas given that things could get lost in translation. 5. )MUT37 Kunpatsorn Rungruang MUT37 ใบเฟิร์น – กัญภัสภร รุ่งเรือง – Kunpatsorn is a classic Thai beauty whose allure is concentrated on her perfect figure as well as on her confidence. 6. )MUT07 Krongthong Chantarasompoch MUT07 กรองทอง จันทรสมโภช – Educated in the United States, the 20 year old and 5’9″ tall beauty has a vibrant personality. She is clearly comfortable in her own skin. 7. )MUT34 Ratchanok Naowaset MUT34 เฟม – รัตน์ชนก เนาวะเศษ – Very poised and she has a very sweet personality. 8. )MUT38 Supaporn Rittipruk MUT38 โบว์ – สุภาภรณ์ ฤทธิพฤกษ์ – She’s got a lithe figure. A bit inconsistent but with proper styling, she can shine through. 9. )MUT22 Thanaporn Soranun MUT22 ลูกศร – ธนพร สรนันท์ – A bit subdued in personality, this 22 year-old, 5’9″ tall beauty has unique features that stand out from the rest. 10. )MUT28 Jiratchaya Leelaprapaporn MUT28 เบส – จิรัชญา ลีลาประภาภรณ์ – Soft beauty with beguiling aura, this girl can pull an upset!